Screen capture from TheSmithPlays video. If you’ve got a spare three hours, you can watch a YouTube streamer set a remarkably high score in Call of Duty: Black Ops II by hanging out in a pool of goop. With the recent addition of Black Ops II to Xbox One backwards compatibility, several players are going back to set new high scores on its Zombies mode maps. One popular challenge is “No Revive,” meaning you only get one life to see how many rounds of undead you can survive. On Sunday, YouTuber Patrick “TheSmithPlays” Smith took on the game’s “Die Rise” map, using an interesting strategy. Smith already had money stored in the in-game bank account, so he was able to quickly purchase all the perks and guns he needed to be successful. He then obtained Die Rise’s craftable weapon called the Sliquifier which causes zombies to slip and slide around the map and die. The Die Rise map is a shambolic, deteriorating building with several slanted levels, allowing Smith to shoot the Sliquifier goo onto the floor of a tilted room. Everyone viewing the stream watched Smith sit in a corner with claymores as a backup defense, shooting the Sliquifier ammo onto the floor to easily kill the zombies. 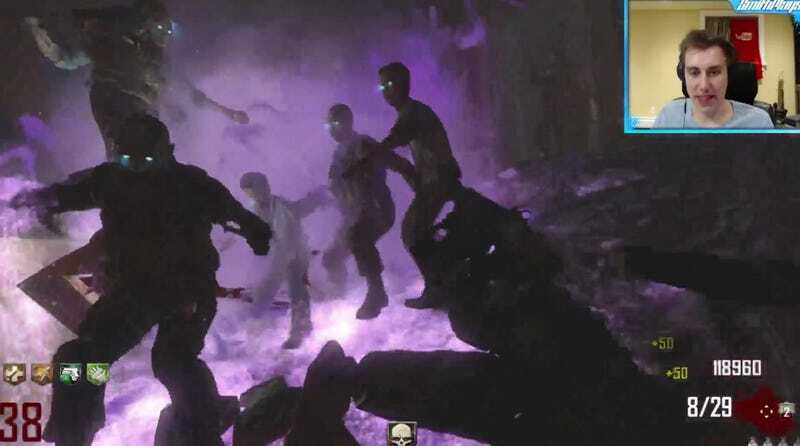 To put an exact number on it, 10,364 zombies danced and slipped to their death from Rounds 17-74, placing him as 6th in the world on the map.